UP कृत्रिम गर्भाधानकर्ता Jobs Recruitment-2019: Uttar Pradesh Pashudhan Vikas Mission is released a new notification for the available Pashumitra, District Coordinator and Animal Health Worker jobs. 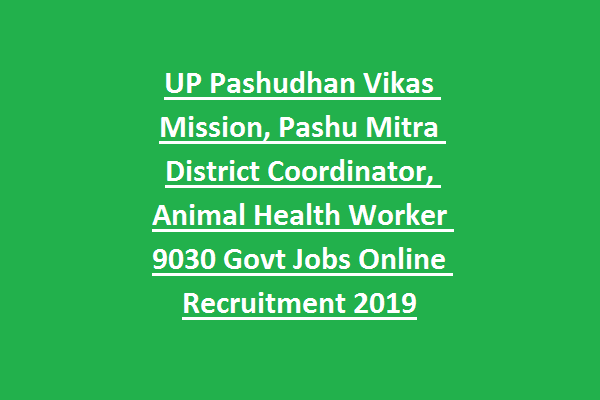 There are 9030 vacancies in this UP Pashumitra, ANIMAL HEALTH WORKER recruitment 2019. Online from submission last date for this UP Pashudhan Vikas Mission Vacancy of Pashumitra and AHW posts is 20-04-2019. Candidates selection for this UP कृत्रिम गर्भाधानकर्ता and other posts is on basis of merit in qualification. Short listed candidates will be get trained by Pashudhan Vikas Mission for 4 to 6 months. Apply online for this UP Pashudhan Vikas Mission recruitment through official website of https://www.pashumitra.in. Age limits, post wise salary, training details and other details of UP कृत्रिम गर्भाधानकर्ता, ANIMAL HEALTH WORKER AHW jobs recruitment notification 2019 is given below. 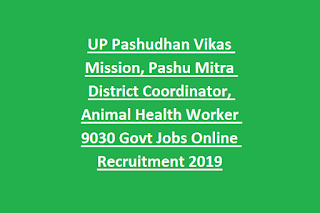 There are 9030 vacancies in this UP कृत्रिम गर्भाधानकर्ता, ANIMAL HEALTH WORKER jobs recruitment 2019.
posted under Pashudhan Vikas Mission. Candidates can apply online on or before 20-04-2019 for this AHW, Pashumitra Jobs. UP कृत्रिम गर्भाधानकर्ता short list release date other information will be updated.